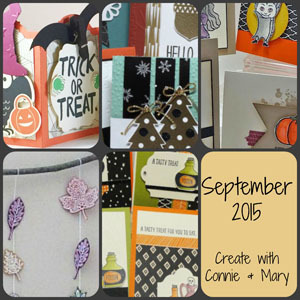 Welcome everyone to the Create with Connie and Mary Saturday Design Team Blog Hop. Do you LOVE our new look? WE DO!!! We are gearing up for the Holiday Mini and FABULOUS FALL!!! For the next couple of weeks, you are going to be ‘treated’ (definitely not TRICKED) with the design team members’ take on Halloween! This is one of those cards that started one place in my head and ended up a totally different place on paper! LOL!!! I do though LOVE the way it turned out! Old Olive – 3 3/4 x 5, add spider web doily to the panel, trim off the sides. Happy Haunting dsp – orange diagonal strip – 1/2 x 4 1/4, add to panel on angle. Silver Glimmer – 3/8 x 4 1/4, add to panel on angle. Tangelo Twist – 3/4 x 4 1/4, stamp greeting using Versamark, black emboss, add to panel on an angle. Trim off ends on both sides of panel then add to card front using dimensionals. Stamp spider si times on Very Vanilla using Versamark, black emboss, cut out and add to card front using dimensionals. How fun is that! 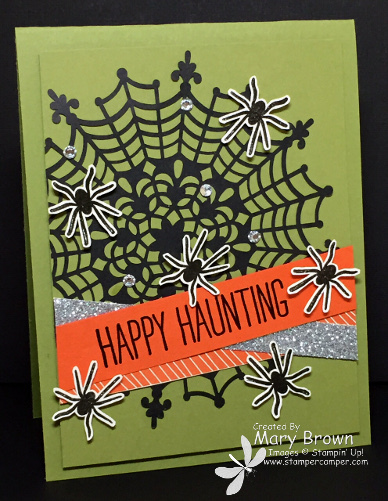 I do like the way my card turned out…GREAT for Halloween! And speaking of GREAT…guess what time it is? It’s time for the next Create with Connie and Mary Mini Session! Each mini session contain 3 cards sets, 2 3D items and a bonus card set! 6 GREAT ideas for ONLY $8.95! You really can’t beat that! Now is a GREAT time to subscribe! The session opens September 13th! Check out Create with Connie and Mary for all the information! Let the party begin! We’ve change the way to get from one blog to the next to use the buttons below to go either backward (previous) to the Create with Connie and Mary site or forward (next) to the very talented Nicole Tugrul. This entry was posted in Create with Connie and Mary, Halloween, Holiday Mini, Saturday Blog Hop and tagged Cheer All Year. Bookmark the permalink. oh I love this!! Especially the strips of paper criss crossed towards the bottom and that doily! So scary cute, Mary! Love those web doilies and the way you did the sentiment!! Love your card Mary! I really like how you add the dsp, glimmer paper, and sentiment at an angle.